RFID, QR Code, or NFC tags, the point is the same; to enable you and your clients to know when and where your officers are when that officer scans a NFC, RFID or QR code at various checkpoints on their guard tour. And unlike “points”, wands, pipes, old-fashioned key systems, or the paper and pen “honor system”, scanning NFC, RFID and QR allow the data to come to you and your clients in real-time. That kind of true situational awareness is huge, and makes all the difference in today’s competitive security guard services business. 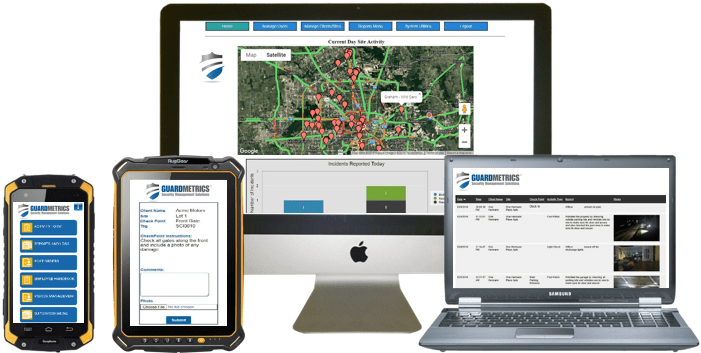 GuardMetrics is pleased to bring you added convenience with a guard tour system that can scan RFID, QR and NFC tags, and that works on any smart device; Android, iPhone, Windows phone, etc.! Some members of the GuardMetrics team, including those involved in the development of the guard tracking and reporting system, were in the guard business before the first guard tour wand or pipe was invented! So, we are more than familiar with the security guard business and what you need to make it run smoothly, and profitably. Call or click here for a guard tour system capable of scanning QR code, NFC or RFID tags that works with any smartphone! And the convenience of working on any smartphone doesn’t stop there. Because of the unique design of the GuardMetrics guard tour system, you can even have your officers use their own smartphones to scan the RFID, QR codes or NFC tags without costing them in data or battery life! This is because every event submission, whether it be a tag scan, a DAR or Incident submission, a visitor entry, etc., uses about the equivalent of a texts worth of data! And if the guard is using a company phone, that savings is passed along to your security guard company. Either way your security officer agency saves BIG time. With GuardMetrics there will be no more need to buy specific devices to (hopefully) read whatever method of scannable tag you prefer. We cover it all, and without costing you in data and battery life like 90%+ of the guard tour systems out there. Call us today to save money with this unique RFID, NFC and QR code scanning guard tour system. When your security officer scans a QR code, NFC tag or RFID with the GuardMetrics guard tour app, not only does the data go to you and your clients in real-time (or, you can choose to approve what goes to your clients, prior), but you can attach an “instruction” to any or all scanned tags! It is extremely simple to do and, once added, when your officer scans a QR code, RFID or NFC tag, a temporary instruction like, “There was an attempted burglary in this location Saturday. Be on alert,” or a permanent instruction like, “Remember to edit your shift entries before clocking out,” pops up on their mobile patrol phone. And that leads to another important advantage; GuardMetrics provides you with clock-in and clock-out RFID, NFC or QR codes to monitor time at a site or for an officer. And those scannable tags even log the guard in and out at the beginning and end of their shifts! 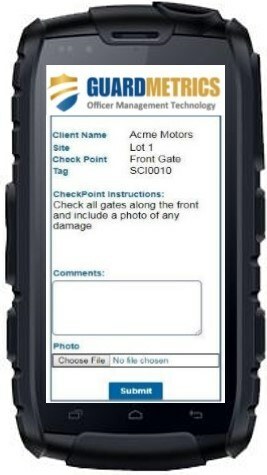 Streamline operations with QR codes, NFC and RFID tags that push instructions to your officers on patrol. So, to review, GuardMetrics makes scanning tags far more convenient than most guard tour systems by allowing for the scanning of QR codes, NFC tags and RFID tags. We then streamline the checkpoint scanning experience further by enabling instructions to pop up on any smartphone; iPhone, Android, Windows-phone, Google-phone, etc. Clock-in and Clock-out scannable tags automatically log your officers in and out for their shifts. And to top it all off, the GuardMetrics guard management system saves you bundles, by allowing for your officers to use their own smart-devices. Or, if you have your security guards use company phones, the system is designed in a manner that uses very little data and battery, while still providing you with real-time situational awareness. Call us today for a demonstration of an affordable guard tour app for scanning QR codes, NFC tags or RFID tags.